Top $ paid for scrap cars, old trucks and vans. We are a major buyer of scrap cars, junk cars and statuary written off vehicles. Call us today to get an obligation free quote now. The Best Car Removal Services In Your Area. Welcome to Cash for Junk Cars Sydney. As your local scrap car removal, we have a friendly and experienced removal team that are working to 24 hours a day, 7 days a week and 365 days a year. Call us today on 0450 341 400 or submit an “online inquiry” to get your free quote. At Cash for Junk Cars Sydney we purchase, remove and tow-away your unwanted vehicles with guaranteed service quality. Call us today on 0450 341 400 or submit an “online inquiry” to get your free quote. tell us more about your car such as make or model and pick up location. We will offer you the highest possible money based on the make and model of your car. if you are happy with our offer, we can arrange a time to pick up your car. we will dispatch our tow-truck driver to your location at your convenient time. You don’t need to come to our junkyard depot. Not only we come and pick your scrap car, but we also make sure to remove your unwanted car at a time that is most convenient for you. we have after hours and weekend car removal service. The car removal industry can be a messy business if it is not carried out in an ethical and eco-friendly manner. At Cash 4 Unwanted Cars, we pride ourselves for being the most ethical and eco-friendly car removals business statewide in NSW. We purchase your wrecked vehicle and pay you cash for your car, bus, truck and motorbike. After paying cash for your car and other damaged vehicles, we safely transport it to our recycling car yard. Being expert wreckers, we extract and sort out all the precious metal used in the manufacturing of your car, bus and truck and we recycle everything. Once your secondhand vehicle is salvaged and the extracted steel is crashed we form new steel at our auto-wrecker recycling plants. By removing your junk car and the unregistered vehicle we make sure your backyard or garage is cleaned off, your pocket is filled with cash and you have a good feeling knowing that you have helped with the protection of our environment too. By selling your scrap car for cash you can have peace of mind knowing that we de-gas, remove the air-conditioning and discard the toxic oils and liquids in a safe and responsible manner. Let us remove your junk car, get your cash today and contribute to the health of your local community with our green and environmentally sound practices. The Top-Notch Buyer and Removal Service of All Makes, Models, Brands and Conditions. For Fee-Quote and Instant Cash for your, Scrap Car Removal Call US Now on 0450 341 400 or fill out our online form here! We Purchase All Types of old and secondhand Cars in Sydney, Wollongong, Newcastle, Orange, Dubbo and the rest of NSW! 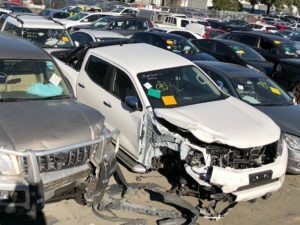 As Sydney’s No 1 buyer of Scrap Cars, Junk Car Removal Sydney offers you top dollars of up to $9999 for your damaged, wrecked, accidental and out-of-order vehicle. Junk Car Removal Sydney offers a free removal service in every suburb of Sydney. We also offer our free scrap car removal in all regions, cities, towns and countries of urban and rural NSW. At Junk Car Removal Sydney we offer a 24/7 Scrap Car Removal that is reliable, convenient and competent. Our scrap collection yard buys cars, trucks, buses and motorbikes of all makes, brands and conditions. We purchase old sedans, out-of-order SUVs, broken 4x4s, unregistered trucks, rusted buses, dented jeeps, derelict Utes and abandoned motorbikes. Our junkyard is a recycling business best known for fairness, transparency and ethical removal of unwanted cars, trucks and buses. Junk Car Removal Sydney is a green and environmentally-friendly dismantling and recycling scrapyard. We dispose your unwanted car, damaged bus and flooded truck with strict guidelines in order to insure the safety of our community and the protection of our environment. If you have an unwanted car that you want to dispose today, congratulate yourself for reaching out to the best and biggest car removal and recycling center. At Junk Car Removal Sydney we collect all damaged, rusted and dented cars, Utes, trucks, semi-trucks, buses and mini-buses. If you just had an unfortunate experience and you were caught up with an accident, we are here to offer you our free accidental car removal service. If you have a decommissioned 4×4 or a wrecked station-wagon that you find it irreparable and it is lying uselessly in your garage or on the corner of your backyard or farm, we are here to offer you a top-notch removal service with literally thousands of dollars cash in your pocket. Welcome to Junk Car Removal Sydney. As your local scrap car removal, we have a friendly and experienced removal team that are working to 24 hours a day, 7 days a week and 365 days a year. Call us today on 0450 341 400 or submit an “online inquiry” to get your free quote. At Junk Car Removal Sydney we purchase, remove and tow-away your unwanted vehicles with guaranteed service quality. The Top Dealer of Scrap and Used Cars in Sydney and in NSW The Cash 4 Unwanted Cars, is undoubtedly the top and No 1 dealer of the old, used and secondhand cars, buses, trucks and motorbikes statewide. Our car recycling and removal business has accumulated many years of experience in buying damaged, smashed and unrepairable vehicles.